Antony Jenkins, founder and Executive Chairman at 10X Future Technologies, culminated a long and successful career in banking by running Barclays Plc. Before that, he ran the retail business at Barclays and he was a senior executive at Citigroup, in the cards business. Antony set up 10X as he believes banking is broken. 10X Future Technologies aims to transform banking with its next-generation cloud native technology platform, using 10X SuperCore to enable their clients to engage their customers with more timely, relevant, and personalised experiences when it comes to managing money. Q: What problems did you aim to solve by setting up 10X Future Technologies after working in the banking industry for a very long time? I have often described banks as being museums of technology. Throughout my banking career and beyond, I have wondered why banks don’t work better for their customers and why doesn’t technology create true transformation in financial services? As I began to work on that problem and thinking about the other themes that had dominated my career, it became clear to me that one of the real impediments to banks being able to deliver what their customers want and what they need for their own shareholders is technology. Most large financial institutions have many generations of hardware and software within them, and they are generally organised around products — so there will be a separate system for loans, a separate system for current account, separate system for savings and so on. These systems are not interconnected which makes it very difficult for them to be effective in today’s world. So I wanted to create a new platform to deliver banking services in a way that’s 10 times better than the traditional method of doing things — 10 times better for the bank, 10 times better for its customers, and crucially 10 times better for society — and for that we have built the world’s first cloud-native platform to support banking. Q: Could we dig a little bit further into what is cloud-native? There is a big distinction between cloud and cloud-native. Cloud-native is using capabilities developed specifically for the cloud that give you faster ways to develop code, better ways to test it, and better ways to deploy it. This cloud-native technology is what we have used to solve the problem I described earlier. At 10X, we’ve built something called the ‘SuperCore’, which is an architecture that is totally agnostics to product and allows a customer’s data to appear only once on our system, so that you don’t get the duplication or fragmentation, I described before. We have also built in many other features that as professionals in the industry, we wished we had when we were working at big banks, like the ability for non-technical people to actually build product and deploy it directly into the system. Q: Can you explain, in the existing paradigm, what makes these technology transformations so complex, both in cost and managerial terms? 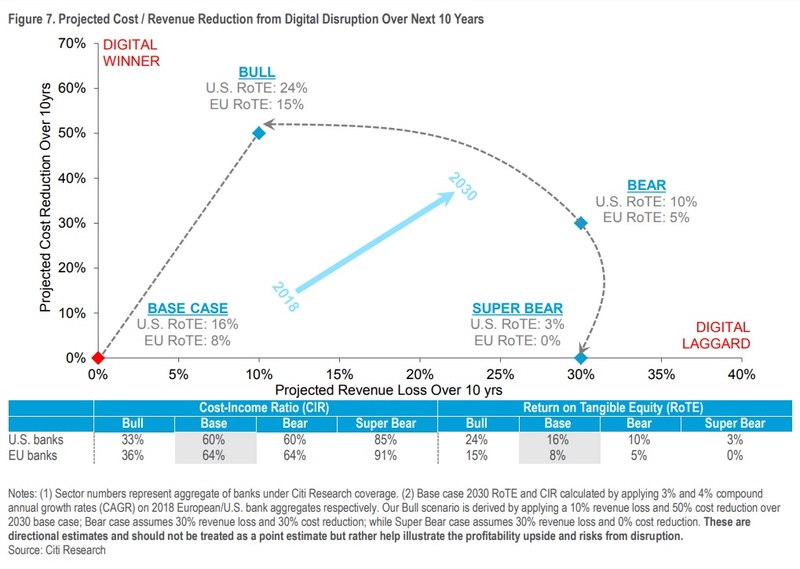 I believe product migration is the challenge when a bank undergoes transformation. When you look at older banks, there will often be hundreds of product variants in the back book even if banks today usually only market 10 or 20 variants of any given product. So you have to make choices about the product portfolio and decide which customers to migrate to which products. Building the same type of functionality on a different platform has been another challenge because it is very difficult and time-consuming owing to the inflexibility inherent in the old technology. On the contrary, our technology is highly flexible. We use micro services. These are small pieces of software code performing unique functions. For example: charging a fee, changing an address, charging an interest rate etc. Because we can assemble those micro services highly flexibly, it significantly reduces the time it takes to build new products on the new platform. Q: Where do you think the banking industry is in its journey of technological transformation? My view is that we are still at the beginning of the beginning of the transformation and it is early days. However, if I were to think back two years, banks would acknowledge that they had challenges around technology, but they would talk about things like how do we deploy mobile banking applications, how do we use big data, how do we deal with cyber security, etc. Now what I have noticed is that this has really become a strategic topic for some banks. I would not say all banks, but for some banks. We are approached probably once a week by a bank from around the world that is now starting to think about how to address these challenges. Q: How would you differentiate the winners and losers of this transformation? How would you identify banks that can make themselves future proof? I would assess if the technology issue is addressed strategically by the bank, or is it simply seen as a functional issue. Now the other thing to unpack is when people talk about their technology strategy there are many things people do which are quite tactical. As I described before, you have these fragmented systems and sometimes you have to get data out of one system and into another. A classic example is name and address. Most banks have created some kind of portal or some – somewhere in the app where you can go and change your address and move from house A to house B. Because of this fragmentation of systems inside the bank, updating that across the databases is often not an automated process. Q: What does the bank of the future look like, in say 2025 or 2030 compared to the bank you worked at in Barclays? How different is it? First I think about this in phases. As I said before, we are at the beginning of the beginning. My view is in the next three years, you’re going to see banks gearing up on use cases on these types of technology. In a three to five to seven-year timeframe, you’re going to see material migrations of parts of bank businesses onto this new technology. By 2030, I think you’ll see some banks that have substantially moved into this new world. It means that banks will be able to operate with fewer people. If you look at an average bank and ask them how many people work in operations and technology? It’s close to 20,000 – 40,000 people. It can be more than 50% of the workforce are doing something called operations and technology. 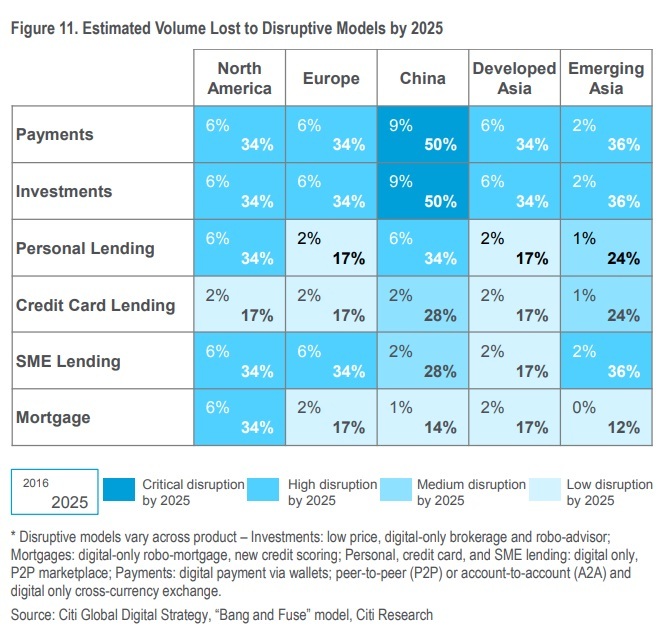 In a 2030 banking world, you probably need 10% of those people. Similarly, in data and analytics where a large number of people are just taking data out of the systems, cleaning it up, parsing it etc., a lot of that work will go away. So in my view, you could certainly see a large bank running with somewhere around 30% to 50% less people from what it has today and I think you could do the math on the cost income ratio. On the cost-income ratio, I think it will go into 30% area and even below 30% depending on the business. You can then extrapolate that what that does for return on equity (RoE). I would expect it to be in mid-teens or so. Q: Do you believe that cost reduction from workforce reduction leading to RoE’s going above cost of capital will be the end-story and there won’t be other costs which will shoot up like technology spends or that will rationalise with large systems getting replaced by modular next-gen systems? There is obviously going to be a shift towards these newer technologies. These newer technologies are orders of magnitude, cheaper to develop on, and easier to operate. Therefore, tech spending will probably come down over time because you are investing less and less in maintaining these highly inefficient legacy systems. There is an enormous economic opportunity for the banks that embrace these technologies. If a bank outsources a chunk of its technology to us, we are employing people but the number of people we’ll employ versus what the bank would employee would be very much less. Q: You are looking to make banking 10X better for clients. So what is the banking experience in this mythical 2030 world for clients? Let me give you a framework as to how I think about it. Banks only do six things. They make and receive payments. They borrow and lend. They provide risk management services, often in the form of insurance. And they provide information to their customers on all of those things. If I take those six things on one hand and then think about the fact that if you look at consumer markets, 30% to 40% of people in developed societies have no money and they have very basic transactional banking needs. Another 30% to 40% of people have very little money. Then the remaining 20% consists of people who have some money, the mass affluent, the high net worth individuals, and then ultra-high net worth at the end of the spectrum. In that stratification, people at the end of the spectrum, have a lot of money, so they probably still will want to deal with a human being. For everybody else, most of their financial needs, across the six things I described, can be automated and they can be automated, in a way which is much more intuitive for the customer than the way things work today. I’ve written elsewhere about how you could imagine a world in which the consumer has an artificial intelligence powered tool that basically monitors their financial lives, shops for the best deal whether it’s for mortgage, credit card, loan or savings product and then automatically provisions for that. This way, you take away a lot of the administrative burden and stress that people experience around finances. I think these kinds of processes, where you have artificial intelligence agents always running in the background of your life, and overseeing your finances like a sentinel, is the thing that will be very attractive to customers. Q: We talked about costs going down, client experiences getting better. Can you draw a picture of the revenue side of incumbent banks between now and 2030: How much of the banking revenue pool will get disrupted? It is hard to predict but we do have some analogies in industries like the credit card business, where traditionally people have done co-branded credit cards. Some of these are with store cards; some of them are co-branded cards. A lot of them were in the airline space and so on. The revenue share type arrangements are there but somewhere between 10% and 30% of revenue is shared with the person who has the customer relationship. That’s not inconceivable to me. If you’re having to share 10% to 30% of your revenue, then you’d better be hyper-effective in terms of how you run your business because you’re not going to be able to drive your cost income ratio down or get your ROE up if you don’t do that. The post Interview: Why banking is broken and how to fix it appeared first on Payments Cards & Mobile.